In “Adversaria Buddhica”, an article published by Christian Lindtner on the Wiener Zeitschrift für die Kunde Südasiens 26 (1982), the author collects the references that Bhāviveka makes in his Madhyamakaratnapradīpa (MRP) to other contemporary or previous philosophers or works. In the list on pages 175-176, we meet with the following point «d) A verse from “Guruguru’s *Paramārthanyāyagīti (? )” (…bla ma’i bla mas kyaṅ Don dam par rigs pa’i glu…) […]. It may actually be traced to Saraha’s Dohākośa». Lindtner, in the abovementioned article (p. 175, n. 40), quotes also the Apabhraṃśa version of this excerpt (the translation of the verse is here irrelevant). The presence of a passage from the Dohākośa is very helpful for dating the MRP, because Saraha (with all probability 7th-8th century), as we have seen, is there said to have been the guruguru (the master’s master) of Bhāviveka (on this subject see David Seyfort Ruegg’s arguments in his “On the authorship of some works ascribed to Bhāvaviveka/Bhavya”, pp. 62-63). Hence, if we take for granted the fact that Saraha is the author of the stanza quoted in the MRP – and I do not see, for the moment, any valid reason for refuting that –, it follows that the problem does not point at all on Saraha, rather on the name of Saraha’s work as referred to by Bhāviveka: Don dam par rigs pa’i glu (*Paramārthanyāyagīti, according to Lindtner’s reconstruction), which is undoubtedly a title quite different from Dohākośagīti (Tib. Do ha mdzod kyi glu). Here finishes the letter (*lekha) concerning the supreme meaning [which] actually exhibits reality, called Dohākośa and composed by the great master of yoga Saraha. On the basis of all this, I suggest that Bhāviveka attempted a general description of the work of Saraha – probably inspired by the colophon quoted above – instead of mentioning its title. A possible/plausible explanation of don dam par rigs pa’i glu could therefore be: a) glu stands for do ha mdzod [kyi glu] in the colophon; b) rigs pa conceptually stands for (de kho na ñid) rnal du mtshon pa in the colophon; and c) obviously don dam pa refers to the same word in the colophon. Interesting but the yellow on white is unreadable – and I’m wearing my glasses. Please consider a higher contrast alternative. d.3) “don dam par rigs pa” seems to me to be conceptually/closely related to “rnal du mtshon pa don dam pa”, which is the way the colophon of Saraha’s Dohākośa describes its general content/aim. Of course, these of mine are quite superficial – but I hope consistent – considerations, based on a likewise superficial check of Maitrīpa’s works, in consequence of your suggestion, and if you have something more to add in favour of the thesis “Maitrīpa=teacher’s teacher” or of other perspectives concerning this subject, as I’m not a specialist of this kind of tantric literature, please write me again! With a little experimentation it ought to be possible to make sure if it’s Maitripa or Saraha that is being quoted, I’d think. Anyway, the availability of this amazing resource, which threatens to make Tibetologists obsolete, ought to be better known to the world at large. I like what you write very much, but the flashing adverts are a genuine irritation. There are a couple of them right now flashing the word “FREE” in bold red letters about 30 times a second. I’ve done the same experiment you did using ACIP explorer database (http://www.aciparchive.org/ace/, that is the same on which Vienna’s database depends) but unfortunately the access to rGyud section of the Tanjur is restricted: you can see the titles of the works where the passage(s) occur(s), but the text is not displayed. On the basis of the list found in ACIP, I’ve then got a glance to the TBRC site (http://www.tbrc.org/#home), where unfortunately the Kanjur and Tanjur are simply scanned (no transcription available) and for the moment there’s no possibility for a search. Thus, I’ve checked, very quickly to say the truth (my problem is that a day has only 24 hours, and I need to sleep at least for 6/7! :-)), the works where “our” stanza occurs, and even if it may be that something important/interesting went unnoticed to me, in any case, among the 6 tantric works, 4 are by Saraha and only 2 (those mentioned above, in my previous answer) are attributed to Maitrīpa, and are commentaries (“dka’ ‘grel” and “‘grel pa”), not “glu”. This (4 works by Saraha and 2 commentaries by Maitrīpa) could represent in my opinion a good point in favour of the idea that the stanza was at that time a well-known Saraha’s passage. Hence “bla ma’i bla ma”, that indicates the author of the stanza, should refer to Saraha. Moreover, in “don dam par rigs pa’i glu” I of course take “glu” as a sort of leading or fundamental word for the correct interpretation of the sentence/title. And the presence of “las” indicates that “glu” refers to a (kind of) text. To finish with, many thanks also for your “esthetic” comment. As you can see, I’ve erased the html of the adverts… you are right, it’s really better now! Thank you for your answer. I have no access to Bhāviveka’s original version of the MRP, so I can’t check whether the quotation from the « don dam par rigs pa’i glu »/ « Paramārthanyāyagīti » is also present as such in the original and not only in the Tibetan translation. The quoted stanza does indeed belong to Saraha’s Dohākośagīti. As you know there is a lot of uncertainty about Saraha. As far as I know Maitripā was the first person to propagate the Dohākośagīti and as he perhaps may not have met Saraha/Śabarapāda in person and the Dohākośagīti doesn’t seem to be known otherwise, it may as well have been dictated to him or received by him in other ways… Anyway it’s Maitripā who taught and transmitted the Dohākośagīti to Atiśa. But if it can be proven that an early Indian manuscript of Bhāviveka’s MRP already contains Saraha’s quotation, all my arguments and intuitions would crumble. The verses in apabhraṃśa (Shahidullah) are as follows « cittekka saala bīaṃ bhava-nivvāṇā vi jaṃsi viphuranti, taṃ cintāmaṇi-rūaṃ paṇamaha icchāphalaṃ dei. » I would be curious to know if they have been transposed into sanscrit in Bhāviveka’s MRP ? I have doubts about a lot of texts attributed to Saraha, if not about all of them. The earliest ones seem to be the sādhana and the pañjikā of the Śrī-buddha-kapāla-tantra, that Davidson situates in the 9th century. As for the Dohākośagīti, Maitripā is very present in anything related to it and he did seemed to have a specific agenda (mixing tantric theory with Prajñāpāramita) that Atiśa may have been aware of and may have followed himself. So for lack of other proof (especially a quotation in the sanscrit MRP) I find it safer to think of him as the origin of the Dohākośagīti. There were doubts early on about the authenticity of Maitripā’s teachings (see Kurtis R. Schaeffer, Dreaming the Great Brahmin). I do think that Advaya Avadhūta and Maitripā are the same person. But it would have been more prudent indeed to mention the name Advaya Avadhūta. There seem to have been different Tibetan translations of the Dohākośagīti, perhaps one of them was called « don dam par rigs pa’i glu ». Not very plausible though since the verses seem to correspond almost exactly. Or it’s simply a description as on may find at different places. E.g. in the Dohākośahṛdayārthagīta-Ṭīkā it is referred to as « mi g.yo ba’i chos nyid kyi don du ‘gur du bzhes pa’i glu ». thanks to you for this detailed answer. Unfortunately the Sanskrit original of the MRP is considered lost and the text survives only in its Tibetan translation (no Chinese translation being available). Thus, we cannot know whether or not Bhāviveka rendered into Sanskrit the Apabhraṃśa, or if *Paramārthanyāyagīti (conjectured by Lindtner) does actually correspond to “Don dam par rigs pa’i glu”. Moreover, there are problems concerning the author of the MRP. According to some scholars, this Bhāviveka is the one who flourished in the 6th century and wrote also the Madhyamakahṛdayakārika (MHK) and Tarkajvālā (TJ) thereon; according to other scholars, the author of the MRP lived at least in the 8th or 9th century, and consequently the existence of at least two Bhāviveka-s is to be assumed (on this point an interesting discussion can be found in Eckel, “Bhāviveka and its Buddhist opponents”, pp. 21-27). I’m personally persuaded that the MRP has been compiled by the deutero Bhāviveka in the 8th-9th century on the basis of the dating of the works/philosophers quoted in the MRP: besides pre-6th century sources we have mention of Candrakīrti, Dharmakīrti, Kambala, Āryadevapāda (the author of the Skhalitapramathanayuktihetusiddhi, Svādhiṣṭhānakrama, Cittaviśuddhiprakaraṇa, Jñānasārasamuccaya), Nāgārjuna (as author also of the Pañcakrama), the tantric Padmavajra, etc, and of course, “our” stanza. Now, in my opinion, if we assumed that the MRP has been written by the same hand that wrote the MHK and TJ, we would have necessarily to admit that all this references are nothing but subsequent interpolations. But if we erase this supposed interpolations, the text of the MRP would be drastically reduced in lenght (this, nonetheless, does not mean that there are not interpolations, or that “our” stanza has not been added by someone different from Bhāviveka). Helmut Krasser, in a forthcoming article, deals with the TJ demonstrating how the (Chinese and) Tibetan translations from Sanskrit were based on a text in which probably some student monk added personal comments. This could have been also the case of the MRP and in front of this argument the thesis put forward by Gokhale appears weakened. Moreover, to confirm Gokhale’s position, it would be useful to check at least the principal translations into Tibetan by Atiśa and Nag-tsho, for determining whether they usually manipulate the texts or not (but this is of course a monumental work!). Now, the problem is that, as you know well, we are unable to define exactly when Saraha flourished and whether or not he actually wrote all the texts attributed to him. In any case – following Seyfort Ruegg’s suggestions –, if he was the teacher of Nāgārjunapāda (about 7th-8th century), having been Nāgārjunapāda with all probability the teacher of the deutero Bhāviveka (and of Āryadevapāda), then “bla ma’i bla ma” could refer to Saraha, who would have lived around the 7th century. The 7th century is the aproximate epoch of the ascendancy of the Apabhraṃśa; nonetheless, I’m not sure that Saraha originally wrote the Dohākośa in Apabhraṃśa, indeed he could have composed that work in Sanskrit, having he been of brahminical origins, as his appellation “bram ze chen po” testifies (Guenther 1969, pp. 8-9; Braitstein 2004, pp. 20-21). you say that the Dohākośa has been propagated firstly by Maitrīpa and, as we know, Maitrīpa for cronological motives didn’t meet Saraha. 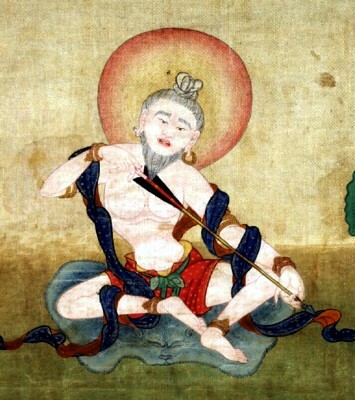 Could it be possible that this writing of Saraha (let us provisionally consider him the master of Nāgarjunapāda), had been taken as of a minor importance – for whatever reason – in relation to other texts, and thus preserved but not frequently quoted, untill Tantrism gained more power and Maitrīpa “rediscovered” the Dohākośa, making it playing a somehow central role within his own teachings? It wouldn’t have been the first text rediscovered by Maitrīpa, since he is reputed for having rediscovered the Mahāyānottaratantraśastra amongst other texts. And it did play a huge role in his own system, in other words it came in handy. He could have received this text orally from Saraha’s apparition/vision. He is supposed to have received the instructions orally (zhal nas zhal du brgyud pa). Other, mainly Tibetan, masters had visions, dreams etc. in which Saraha gave them a transmission (see Schaeffer). He could also have made the instructions up himself, as some seem to suggest in Taranatha’s Seven Transmission Lineages, prehaps even borrowing from other traditions and reinterpreting them in a Buddhist way. Nothing new. What is sure is that the Dohākośagīti is very closely related to Maitrīpa and that Atiśa knows it. The few texts translated by this couple that I have seen do contain metacomments (e.g. http://hridayartha.blogspot.com/2011/04/le-subitisme-datisha.html), so I wouldn’t be surprised. But as you say, a thorough analysis would be a monumental work. many thanks for this clarifications! Now – but only if you have a bit of time for a further point – I would like to discuss in brief your statement: «The master’s master could refer to Saraha if Atiśa is the narrator, or Maitrīpa if Naktsho added a comment». «Having the great paṇḍita Atiśa Dīpaṃkarasrījñāna asked the venerable teacher Zaṅs-gliṅ-pa dGe-bsñed-mgon-po (Tāmradvīpin Upāsakanātha?) for clarifications (bka’ drin źus pa las) [on the MRP], later on, in the Somapuri Vihāra, both brTSon-‘grus-seng-ge of rGya and TSHul-khrims-rgyal-ba of Nag-tsho translated and arranged [the MRP] after having investigated again and again [those clarifications?]». In this English rendering I’ve considered “dī paṃ ka ra śrī dzñā nas” as being the subject, and the “la” of “dge bsñen mgon po la” as indicating an accusative (not a “la don”), because of the presence of “źus” (Skr. PRACH, “to ask”, which requires an accusative of the asked person, both in Sanskrit and, if I remember well, also in Tibetan). At this point, taken for granted that the quotation from the “Don dam par rigs pa’i glu” is an interpolation, and if my interpretation is correct, “yaṅ daṅ yaṅ” in the colophon suggests to me that the translators (brTSon-‘grus-seng-ge and TSHul-khrims-rgyal-ba) would probably have assisted to the conversation between Atiśa and Zaṅs-gliṅ-pa and, after a deep discussion, integrated into the MRP some comment by Zaṅs-gliṅ-pa (called “bla ma” in the colophon) and not by Atiśa (even if Atiśa could have played the role of supervisor of the translation). To say the truth, I must confess, alas!, that Zaṅs-gliṅ-pa is completely unknown to me :-(, I know only that Bu-ston refers to a “bla ma Zaṅs gliṅ pa” in his “Chos ’byuṅ”, in a long list of teachers (biginning with Śāntarakṣita) that went to Tibet from India. In any case, whoever this Zaṅs-gliṅ-pa had been, now a set of questions arises: was the guru’s guru, author of the “Don dam par rigs pa’i glu” perhas Zaṅs-gliṅ-pa’s (not Atiśa’s) teacher? Hence, was Maitrīpa also the teacher of Zaṅs-gliṅ-pa (this could be a possible solution)? If not, could have Saraha been the teacher of Zaṅs-gliṅ-pa? And, more in general, what do you think about this perspective (and about my interpretation of the colophon)? Does this point of view lead us somewhere? You ask some difficult questions and I am afraid I can’t give a straight answer. Zangs gling pa seems to be an Indian teacher. Translated back into sanscrit his name should be something like TAmradvIpaka, a Ceylonese? And according to Bu ston a pandita of the same name visited Tibet, but quite a bit later I think. TBRC gives Candragomi as a teacher of Zangs gling pa and King Dharmapala as a student… So perhaps zangs gling pa means simply Ceylonese and in the case of the colophon “dge bsnyen mgon po” is his name? When Nagtsho went to India to fetch Atiśa, the Indian brTSon ’grus seng ge served as his guide. So Atiśa probably kindly requested and received the text from the Ceylonese dge bsnyed mgon po. Later (phyis) in the temple of Somapuri, both Nagtsho and his Indian guide requested the text with insistance (from Atiśa) and translated and edited it. I think the mentioning of Zangs gling pa simply serves to show from whom Atiśa received the text himself. I don’t think the lama’s lama applies to him. The real editing and translating job must have taken place in Somapuri, with Atiśa being present. That’s how I interpret it. On the ongoing and long discussiuon of MHK, and MRP and the two Bhavya/Bhavaviveka-s. Indeed, I remember long ago, and mentioned it in a footnote somewhere, that MRP to a large extent is excerpted from TJ and that MRP (only surviving in Tibetan) in the end is a product pasted together during Atisha’s time. Thanks for this comment. Indeed, large parts of the MRP are nothing but quotations reported verbatim from the TJ (at present, for instance, I’m reading MRP ch.2 – actually, I’m trying to read, cause I don’t have so much time -, whose first folios is almost identical to a long section of TJ ad MHK 9.19). Moreover, I must confess that during these last months, after having reflected with more accuracy on the above discussion between Joy and me, and after having consequently checked with deeper attention the uniqueness, position and contents of the Dohākośagīti quotation referred to in the MRP, I came to the conclusion that this citation is with all probability – but of course without any definitive centainty – a later interpolation (added to a text whose first “draft”, in my opinion, could be dated around the 9th century), inserted in the text by someone who belonged to Maitrīpa’s legacy, maybe by Atīśa’s disciple TSHul-khrims-rgyal-ba. And this undoubtedly concurs to corroborate your position. Now first I saw – and answered- your email. Happy that we agree, it is in the laboratory of Atisha and his disciple Tshul-khrims rgyal-ba around 1047-48 AD. (also my idea way back) who “invented” this work by excerpting from TJ and other works. Now the latest development (I am unfortunately not always following the exciting discussion : Krasser now lately think (and you too?) that MRP is an independent work, made by someone in the 9th cent. and consequently brought along to Tibet by Atisha. If so, MRP at the time of its origin must have been borrowing heavily from TJ. thanks for commenting! After having written you back via mail, here I add that on the basis of the MRP colophon, according to which the learned Atīśa asked the Ceylonese teacher dGe-bsñed-mgon-po (*Upāsakanātha?) for a copy of the MRP, I suspect that the text was already “constituted” and well-known during Atīśa’s epoch. However, the presence in it of quotations from works probably written not before the end of the 9th, beginning of the 10th century, suggests to me that the MRP could have seen the light in the first decades – or around the middle – of the 10th century. We would have, thus, a likely span of more or less 60/80 years for the divulgation of the MRP, before Atīśa’s request.